In America we have to create our own cool Ford Transit vans. 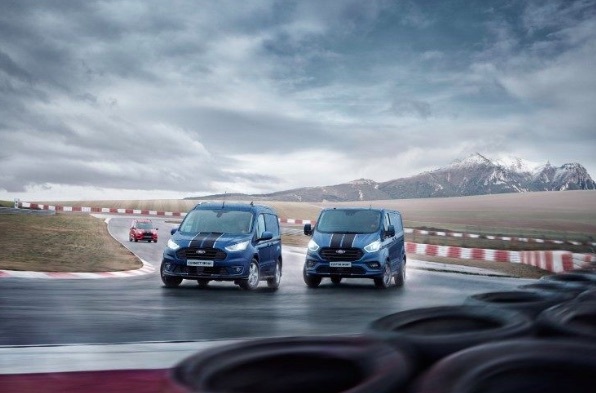 Meanwhile in Europe, the new 2019 Ford Transit Custom Sport lineup is a more enthusiastic choice of a van that can be bought right from the factory, and will be the most powerful Ford Transit van offered in Europe. It will launch mid-year 2019. A new version of Ford’s enhanced 2.0‑liter EcoBlue diesel engine will make 182 horsepower and 306 pound-feet (415 Nm) of torque under the hood of the Ford Transit Custom Sport van, moving the needle by 15 hp and 7 lb-ft (10 Nm). The Transit Custom Sport will lead a range of three Transit Sport van models – all complete with easily identifiable sports stripes, body-side moldings and wheel arch extensions. The 2.0-liter EcoBlue diesel engine features enhanced high-pressure fuel injection, low-friction architecture, and a revised low-inertia turbocharger design, according to Ford. The turbo design helps deliver a broader spread of power across a wider rpm range. Customers will be able to choose between a six-speed manual transmission, or a six-speed SelectShift automatic. The Ford Transit Custom Sport also receives body-color matching bumpers, side mirrors, and door handles. Underneath the flared arches are 17-inch or 18-inch alloy wheels. Driving dynamics have been optimized with a unique chassis specification to deliver enhanced steering, handling, and ride – all for a more responsive and agile overall feel than standard. Inside the Custom Sport features a partial leather interior trim in Ebony, including second or third seats depending on the chosen body style. The Ford Transit Custom Sport is offered a wide choice of body styles including van, kombi (passenger van), and double-cab-in-van configurations. These body styles are available in both short- and long-wheelbase versions, too. FordPass Connect and Ford’s SYNC 3 communications and entertainment system comes standard in the Transit Custom Sport. This allows the Custom Sport to transform into a WiFi hotspot for up to 10 devices. An enhanced suite of advanced driver assistance technologies are also available including active park assist, adaptive cruise control with intelligent speed limiting, lane-keeping assist, and Blind Spot Information System (BLIS). Interestingly, BLIS now supports trailers up to 10 meters (32.8 feet) in length. Ford upped the power and modified design cues after Transit Custom Sport sales rose by 58 percent in 2018 when compared to the 2017 sales year – with 4,402 vans sold. Ford delivered its best commercial sales in 25 years in 2018, with 380,900 commercial vehicles sold in its 20 European markets. In comparison, Ford sold 127,360 Transit vans in the United States in 2017, and 137,794 in 2018. What is the reason Ford will not market these vans in the US?